Ram Kumar Sharma made the announcement at a news conference in Patna, saying that he will write to the Election Commission to recognize RLSP as a separate group. The Rashtriya Lok Samata Party, a constituent of opposition “Mahagathbandhan” in Bihar, suffered yet another setback on Monday with its sitting MP Ram Kumar Sharma floating his own faction and lambasting the party’s founder Upendra Kushwaha for allegedly ignoring committed workers while distributing tickets. The Sitamarhi MP, who has been the party’s “chief whip” in the Lok Sabha and the chairman of the parliamentary board, made the announcement at a news conference in Patna, saying, “I am going to write to the Election Commission to recognize RLSP (Ram Kumar Sharma) as a separate group”. 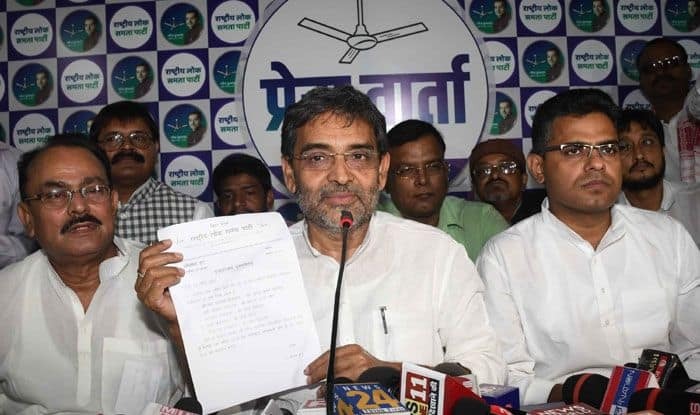 “Like a feudal oligarch, Kushwaha decided on the candidates for all five seats he was allotted in Mahagathbandhan, without consulting me. Jittery over his prospects in his sitting seat of Karakat, he is contesting from Ujiyarpur as well,” Sharma alleged. The disgruntled leader, the only sitting MP in the RLSP other than Kushwaha, also said that the party’s founder had falsely accused Chief Minister Nitish Kumar of using foul language against him. “He denied me a ticket because I tried to stop him whenever he took suicidal decisions like falling into the trap of the Congress and Sharad Yadav and quitting the NDA. He falsely accused Bihar Chief Minister Nitish Kumar of using foul language against him,” Sharma claimed. “The most brazen example of his shenanigans was on display in Motihari (Purvi Champaran). He took money for the seat from former general secretary Pradeep Mishra and reneged on his promise when he got a bigger price from Madhaw Anand. “In the end, he sold the ticket to Akash Prasad Singh who turned out to be the highest bidder. Singh was not even a party member before his candidature was announced,” he said. Singh is the son of former Union minister Akhilesh Prasad Singh, who won Purvi Champaran seat – earlier known as Motihari – in 2004 and was the runner up in 2009 as a Congress nominee. The former minister currently heads the campaign committee of the Bihar Congress. Sharma also alleged “the candidate for Pashchim Champaran, too, has been imported from the JD(U) for a price. Brajesh Kushwaha’s candidature left us all wondering when he acquired the primary membership”. “All through, Kushwaha has functioned in an undemocratic manner. He made righteous noises about the need for representation of lower castes in the judiciary and used the metaphor of kheer (rice pudding) to hoodwink the people with the claim that he wanted to take all sections along. “Whenever somebody raised objections about the near absence of non-Kushwaha OBCs, he was eased out,” Sharma alleged. All RLSP members in the bicameral state legislature had turned their backs on him when he walked out of the NDA, the sitting MP claimed. “He stands isolated today, even though he may be feeling high over getting five out of the 40 Lok Sabha seats in Bihar. Our Jehanabad MP Arun Kumar had parted ways long back. Now our group will work to ensure that he loses all the five seats,” Sharma asserted. A former JD(U) leader, Kushwaha floated his own party in 2013 after having voted in favour of the bill for introducing FDI in retail brought by the then Congress-led UPA government, defying the party whip. When Nitish Kumar, the de facto leader of the JD(U), pulled out of the NDA, Kushwaha cosied up to the BJP. His fledgeling party won all the three seats it contested – riding the Modi wave. The BJP – which needed an OBC face to compensate for the exit of Kumar – promptly rewarded him with a ministerial berth at the Centre. Kushwaha, however, grew uneasy following Kumar’s return to the NDA in 2017. The BJP insisted that all NDA partners make sacrifices in order to accommodate the new ally and asked him to settle for two seats. He ultimately walked out of the NDA in December last year.